April is Distracted Driving Awareness Month, and along with CDOTs Distracted Driving Campaign, I thought it imperative to once again stress the importance of driving distraction-free. In March I discussed in a blog post how smart cars really do not allow for drivers to drive distraction-free, and cited some important statistics and studies regarding distracted driving. And the more I look into distracted driving, the more I learn about the dangers and the myths surrounding distracted driving. The National Safety Council (NSC) has a great flyer on the Hands-Free Myth. A recent poll from NSC showed that 80% of drivers believed hands-free cell phones are safer than using handheld; however, according to the NSC, more than 30 studies show that hands-free systems do not provide less distraction. Furthermore, from their review of 180 fatal crashes from 2009 to 2011, the NSC states that 52% of these crashes involved cell phones. And this isn’t even a complete picture. Additionally, a recent New York Times article discusses research conducted in Texas from 2011 to 2013 data regarding cellphone use and driver characteristics. The study shows that drivers talking on the phone decreased from 20.5 % to 16.4 %. However, texting increased from 6.4 % to 8.4 %. The study also showed that women were more than twice as likely to be texting as men. Spread awareness of the dangers of distracted driving and don’t perpetrate the myths that certain driving behaviors are not risky. Remember that in Colorado texting is illegal for all drivers, and texting and/or talking on a cellphone is illegal for all drivers under 18. 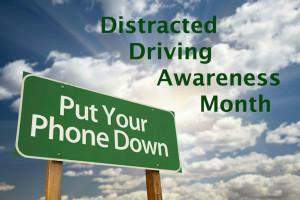 Without spreading awareness of distracted driving dangers we will not be able to prevent car accidents. Also, check out this great video of five Manitou High School students. Stay off your phone, and look up!